1. To prepare the walnut and white bean balls, heat the oil in a medium frying pan over low heat. Cook the shallots and garlic until softened. Add the spices and cook until fragrant. Add the walnuts and cook until lightly toasted. Set aside to cool slightly. 2. Transfer the walnut mixture into a food processor. Add the beans and herbs. Process to finely chop. Season. Shape into 20 walnut-sized balls. 3. Heat half of the oil in a large frying pan over medium heat. Cook half of the walnut and bean balls for 4–5 minutes, turning frequently, until browned all over. Transfer onto a large plate and set aside. Repeat with the remaining oil and balls. 4. To prepare the sauce, heat the oil in a large deep frying pan over low heat. Cook the garlic until softened. Add the paprika and cumin and cook until fragrant. Add the passata, water, yogurt and maple syrup and bring to a simmer. Simmer over low–medium heat for 10 minutes. Season to taste. Add the browned walnut and bean balls to the sauce. Simmer for 5 minutes, or until heated through. 5. Meanwhile, to prepare the fried onion, heat the oil in a medium frying pan over medium–high heat. Cook the onion until golden brown. Drain on kitchen paper. Meanwhile to prepare the cauliflower rice, place the cauliflower in a food processor and blend until finely chopped into rice-sized grains. Heat the ghee in a large frying pan over medium heat. Cook the flaked almonds until golden. Add the cauliflower and spices and cook, stirring occasionally, for 3–4 minutes, until cauliflower is just tender and heated through and spices are fragrant. Season with salt and pepper. Cover and keep warm. 6. 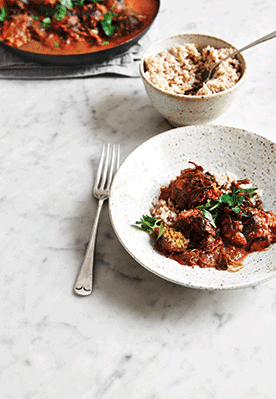 Serve walnut and bean balls with fragrant cauliflower rice, scattered with chopped herbs and fried onion.